Dry food ingredient blending is the core of our business. In fact, it’s the only thing we do, which means 100% of our attention is dedicated to doing it better than anyone else. 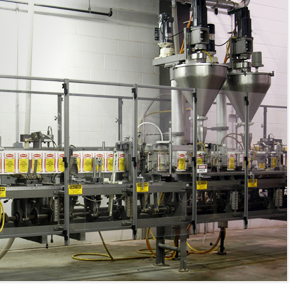 Blending some or all of the ingredients required for finished production, Kent Precision Foods Group customizes each blend to meet your specific taste, performance, cost and packaging specifications. Whether you’re trying to maintain particulate size, add in oil- or oleoresin-based color and flavor ingredients, or simply combining multiple ingredients…in all cases, you can be sure that maintaining product consistency, integrity and uniformity are our top priorities. To this end, we are unique in that we maintain separate sweet and savory blending facilities. We are also exclusively a dry blender; what few liquids we handle (such as those for color or flavor) are added under strictly controlled conditions. With our expert team of mixers and blenders, you can use Kent Precision Foods Group to produce products for nearly every food category imaginable.